Infosparks is a market data reporting and analysis tool. Ideal for: Larger brokerages; regional MLS boards wanting a more powerful solution for market data curation and dissemination. Engaging, organized interface makes interaction simple. Highly versatile applications of common market data. Embed code and sharing tools make publication easy. This is a powerful real estate business tool savvy boards should offer to members. However, it’s not designed for stand-alone adoption by small or independent agencies. Larger brokerages can find measurable value in it. Infosparks is used primarily by Boards of Realtors around the country wanting to provide members with a better way to parse and present data. In that respect, I find it’s a winner. If your board is offering you shoddy PDFs or Excel-generated .JPGs to download and share with your customers, it’s not looking out for your best interest. This is not difficult-to-use software. It was designed by data-heads who love code so much, they decided to partner with UI designers to ensure everyone can share in their joy. Users are offered a number of ways to filter and peruse market data in board geographies by property type, square footage, bedrooms, price range or any other major search characteristic popular in your region. If your board offers shoddy PDFs or Excel-generated content to share, it’s not looking out for your best interest. Users don’t have to choose only the board-named submarkets. The software allows for search parameters to include a ZIP code, city name or planned development. Up to four geographies can be set-up at a time, and each one is color-coded for easy reading. 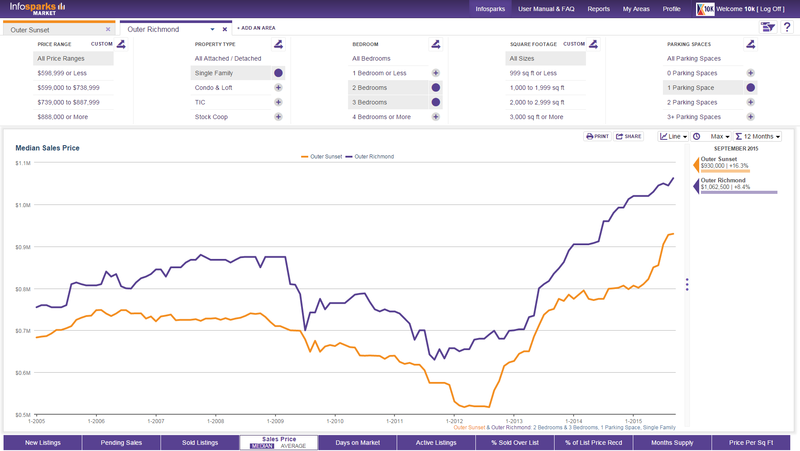 A default line graph will adjust as you toggle through property variables. With a property type and place selected, users then parse deeper by browsing the major metrics, like New Listings, Days on Market, Pending, Sold, Active, Percentage Sold Above List Price, Supply and other common statistics. Despite the depth of data being explored, the software is exceptionally responsive. Market timeframes can go back a few months or up to five years. Data point time periods range from monthly to 12 months. Each line in your chart is further summarized by a quick-fact icon on the side of the report. Despite the depth of data being explored, the software shows no delay in presenting it. It’s exceptionally responsive. Scrolling over your line graph reveals a text box summary of the information. A bar graph view is also available. 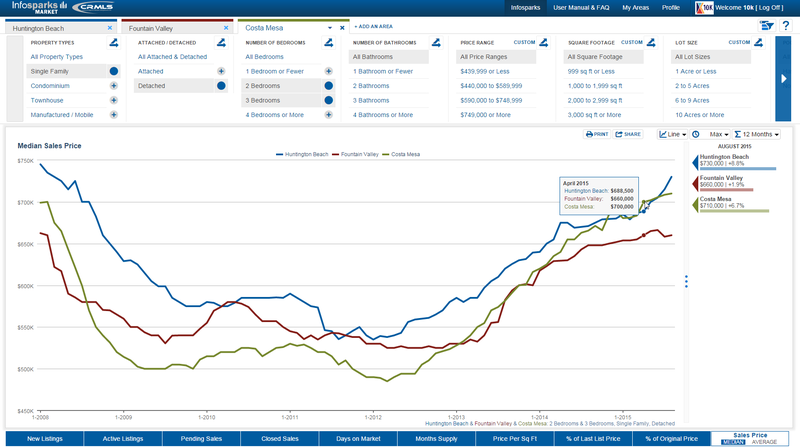 As fun as this tool is for broker oversight and stat-lovers, it does have some nifty marketing features. Market charts are easily shared as a PDFs, PNGs or URLs. Publishing the link to your website shares an interactive chart that communicates specific data points and remains linked live to its source, updating once a day. Obviously, PDFs and image files are static. Report widgets are also published via embed code for websites and other forms of online media. A CSV file of its raw data in table format is also available. 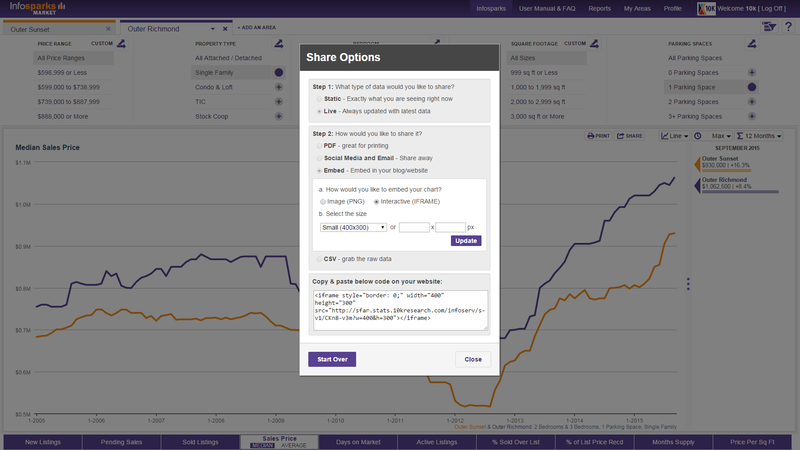 Shared live charts are branded with an agent’s or brokerage’s image and contact information. They also offer a number of other social sharing options. A map tool enables a user to report on a specific MLS geography by drawing points over streets and subdivisions. That region can also be saved for ongoing updates. While the tool is easy to navigate and search, the range of its application is a bit harder to grasp. Which is a good thing. Most users will find the most value in its top-level features. For those who want to dig deep to compare and contrast their market’s trends, this is right up your alley.